La Mercè starts today! Barcelona’s very own annual festival that celebrates the Roman Catholic feast day of Our Lady of Mercy, La Mare de Déu de la Mercè in Catalan. 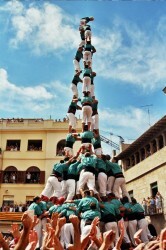 The feast day is on Saturday but in true Catalan style the festivities kick off a couple of days beforehand. Modernity, tradition, gunpowder, street theatre, circus, dance, music… Just mix them all together, stir, and you have the festive cocktail that is being served up in Barcelona these days. For the city is celebrating the feast of its patron saint, La Mercè, a compendium of Mediterranean festivities, authentic Catalan traditions and the talent of artists from all over the world. No one interested in plumbing the very soul of Barcelona and Catalonia can afford to miss this festival, whose special guest this year is the Russian city of Saint Petersburg. 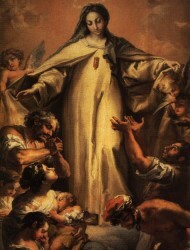 According to legend, on 24 September 1218, Our Lady of Mercy – La Mercè – appeared before King James I and Saint Peter Nolasco, ordering them to found the Mercedarian Order to free the faithful who were prisoners of the Saracens. This manifestation of the Virgin was made patron saint of Barcelona later when, in 1687, the city overcame a terrible plague of locusts after offering up prayers to Her. Nearly two hundred years later, Pope Pius IX officially recognised La Mercè as the city’s patron saint and the people of Barcelona began to celebrate Her feast, though the current format of a programme featuring Catalan traditions was not adopted until the late-19th century. Expect to see plenty of papier maché ‘giants’ known as gegants i capgrossos, the world-famous castells (or human towers) in Plaça de Sant Jaume, the popular Catalan dance, the sardana and of course the absolutely crazy correfoc. There are firework displays on Friday and Saturday down at Barceloneta Beach. And at the Mercè Piromusical – a synchronised firework display to music up at the Magic Fountain at the base of Montjuïc – that marks the end of La Mercè on Sunday evening. Throughout the weekend bands will be playing at venues throughout the city. All types of musical tastes are catered for with the Gracia Power rumba ensemble, the Barcelona Jazz Orchestra and the French multi-instrumentalist, Aziz Sahmaoui. As well as a number of rock and electronica acts down at the Fòrum. The BAM Festival showcases local and international artists including the UK’s very own jazz group, the Portico Quartet and the dubstep producer, Zomby. 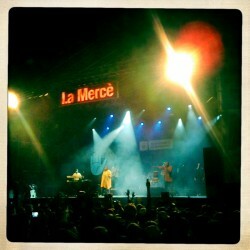 As well as Catalan acts such as Antònia Font, Cuchillo and Guillamino. Check out the programme for the full line-up. Also be sure to check out the Catalan Wine & Cava Show (Mostra de Vins I Caves de Catalunya) down at Port Vell. A great chance to try the wine and cava from the region. The show itself is free to get in to but if you want to try the wine on offer you buy tickets. The number of tickets you hand over for each wine depends on its price. It’s a great afternoon/evening in a lovely setting. There’s so much going on at La Mercè it’s impossible to see everything. Check out these articles to see if there’s anything else that takes your fancy. And of course check out the English language version of the official La Mercè website. 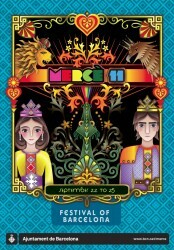 Where you can also download the English language La Mercè programme as a PDF.